I LOVE tomatoes! I think it’s something that’s implanted in all us Hoosiers at birth, so it’s only natural that I would make a Fat Free Bruschetta one day. 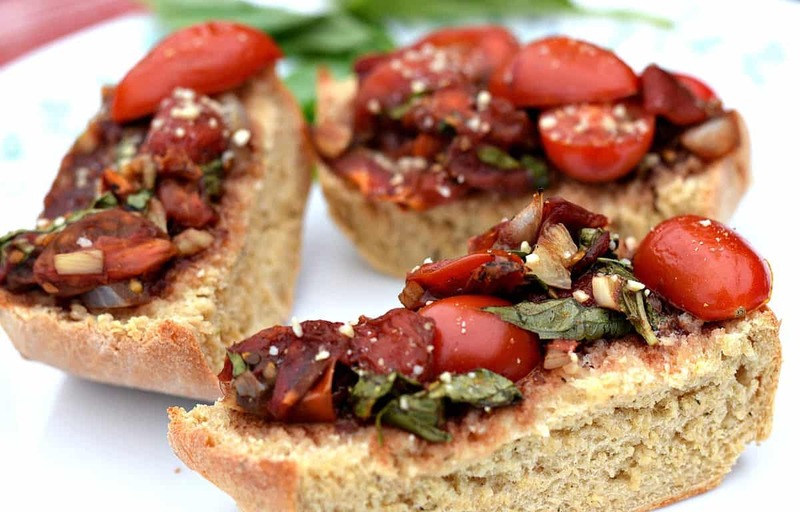 Bruschetta, for those of you not in the know, is an Italian Antipasto usually made from toasted bread rubbed with fresh garlic, and topped with olive oil and salt. But us Americans like to add chopped tomatoes, basil. and mozzarella cheese to make it even more yummier (and add even more calories). 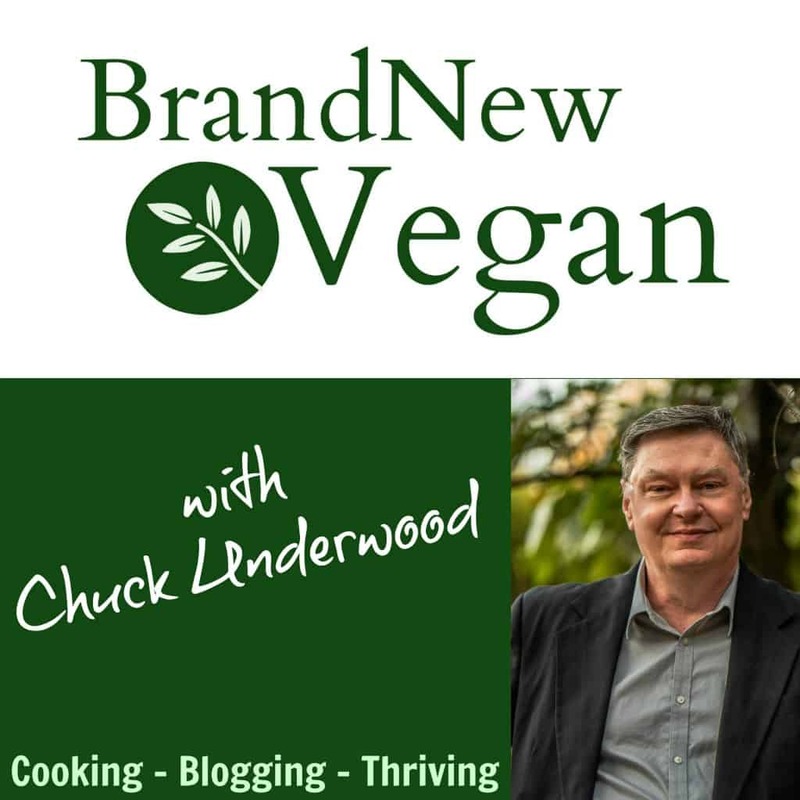 It’s a Western Diet thing – we like our cheese and our calories……not exactly GOOD for us …. And a little Balsamic Vinegar to tie it all together. And it is SO good!! 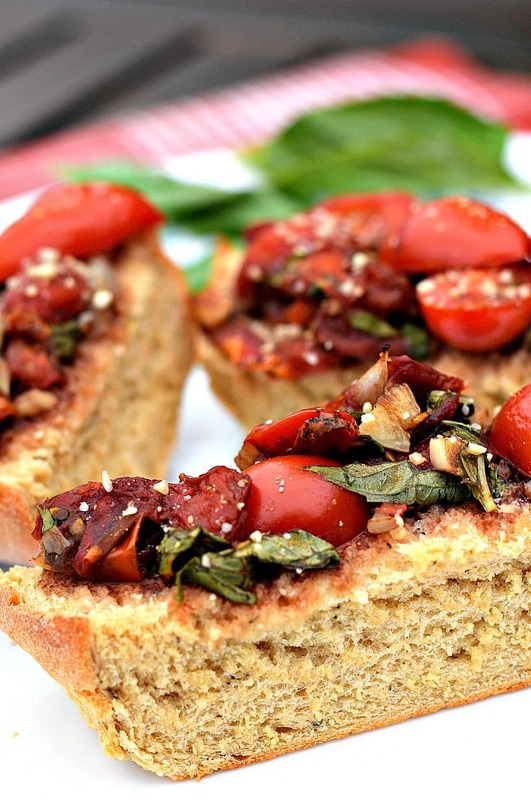 Is it still Bruschetta without the Olive Oil? I don’t care – whatever you cal it I could eat it EVERY DAY! And with a little sprinkling of Vegan Parmesan? 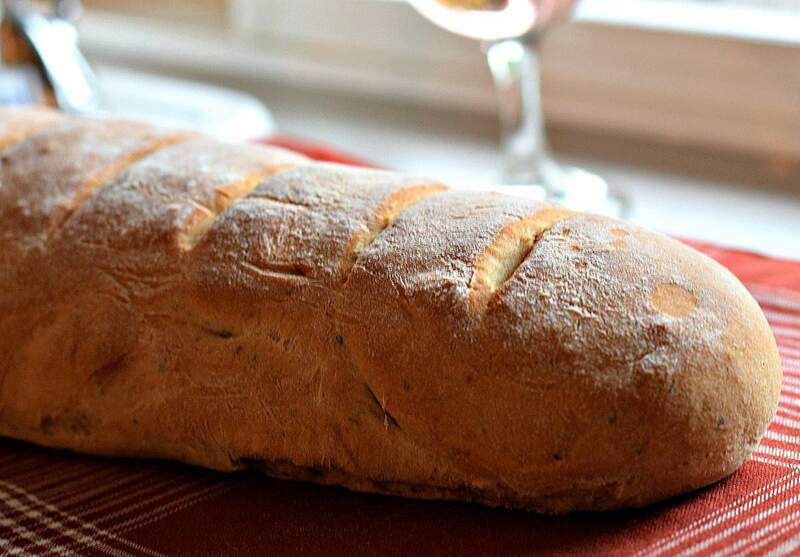 I started this recipe by making a loaf of homemade French Bread. Of course you can use any bread you like, but by making it yourself you know EXACTLY what the ingredients are. And in this case, there’s only 4 ingredients: Flour, Water, Yeast, and Salt. In this recipe I used 1 cup of White Whole Wheat Flour, and 1½ cups of Unbleached Bread Flour. Stir 1 packet of Instant Dried Yeast and 1 cup of warm water in your Stand Mixer’s bowl, and let the yeast bloom for 10 minutes. Then slowly add 1 tsp of salt and the flour, mixing well with a fork until you have a wet, loose, dough. Then, using your dough hook attachment on your mixer, let that mix/knead for about 4-5 minutes, or until the dough pulls away from the sides. Cover with saran wrap or a damp towel, and let the dough rise in a warm spot (a slightly heated oven works fine) for 1 hr or until it doubles in size. Then simply form into a long loaf, cut some slits in the top, and pop it into your cold oven. Yes, I said COLD oven. This is a trick I learned recently and works very well believe it or not. Now set your oven temp to 375° F and your timer for 30 minutes and turn on the oven. As it gradually heats up the dough will rise even more. 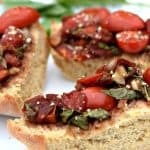 For the Bruschetta, mince 3-4 closed of garlic, and 1-2 tablespoons of onion, and sauté lightly in a tablespoon of water or veggie broth until softened. Meanwhile, wash 2 cups of Cherry Tomatoes and slice them in half lengthwise. Once the garlic has softened, add the tomatoes. Once the tomatoes have softened just a bit, drain out any juices and add the tomatoes to a large bowl. Now were going to add our Basil and we’re going to get fancy and cut them into little ribbons. Take about 15 leaves of basil, wash them lightly, and then stack them 3-4 deep in little piles. Roll up each pile and then slice thinly to create the long ribbons the French call Chiffonade. Don’t you feel all fancy now? Julia Childs would be proud. Add your Basil and 2 Tablespoons of Balsamic Vinegar to the tomatoes and stir well. 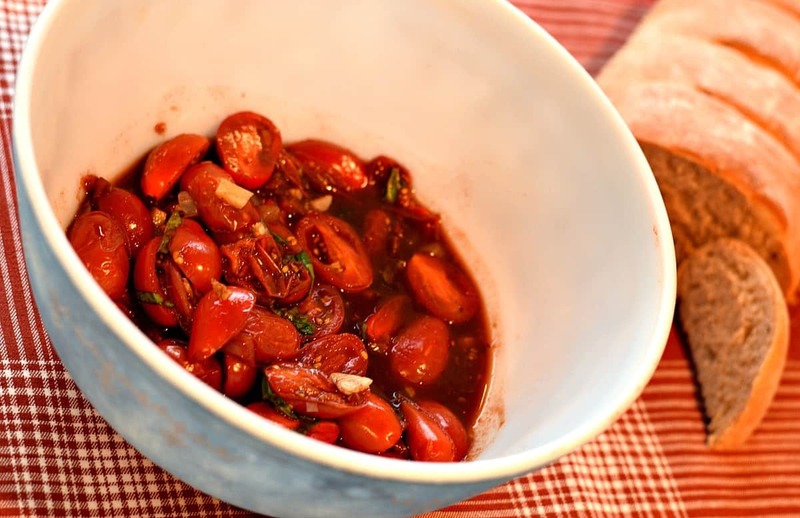 Finally, add 1 more cup of fresh Cherry Tomatoes, sliced lengthwise, to your bowl and mix. I really like the combination of cooked and fresh tomatoes in my Bruschetta. Now put that bowl of goodness into the fridge, and forget about it until the bread is done. The longer you let that bowl sit – the more all those wonderful flavors have time to get to know one another. Yeah it’s a social recipe……. 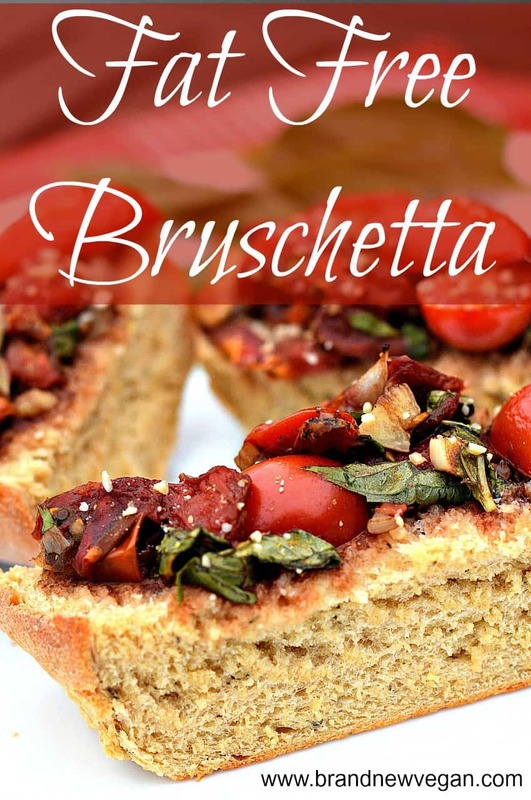 To serve your Fat Free Bruschetta, slice your homemade French Bread into small pieces and drizzle with your Bruschetta. Top with Vegan Parmesan is desired and bake for an additional 5 -10 minutes or so until toasty. I LOVE tomatoes! I think it's something that's implanted in all us Hoosiers at birth, so it's only natural that I would make a Fat Free Bruschetta on day.... and trust me - this is YUMMY! Sounds amazing! I’m going to use this with my vegan cooking class next month! I made the bread, but it didn’t rise. It was very dry and crumbly and wouldn’t form a ball. I think the yeast may not have taken. I’ll have to try again. I found that 2 1/2 cups of flour was too much. I added 2 cups and it was just enough.